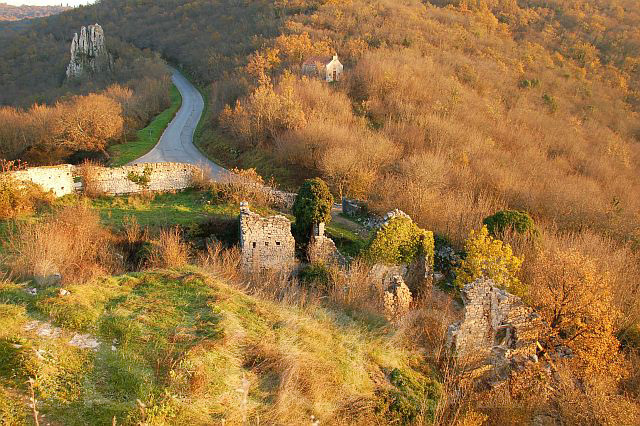 Dvigrad (meaning ‘two towns’) is a prehistoric settlement located in Istria. It was originally settled by the Illyrians, and later ravaged by the bubonic plague in the 17th century, with the town's only three surviving families eventually abandoning their homes in the early 18th century. Today what remains of the town is the stone ruins making up an archaeological site on a scenic hillside. You can see more pictures of Dvigrad here. I actually had a hard time coming up with words starting with D, and especially the letters that follow: Đ (very similar in pronunciation to DŽ but softer) and DŽ (pronounced like the J in 'jam'), because there seem to be few Istrian words starting with these sounds. Anyone have any ideas for these letters?? Dž could be džem (jam) and for đ we could use some help (http://www.istarski-rjecnik.com/pretrazivanje/1/%C4%90/) and say đurđica or đakon? or Đžamonja and his sculptures park in Vrsar and đornal (newspaper)? Hi Marta, thanks so much for your suggestions! I had actually thought of džem, but this is not something typically Istrian I think, same with đurđica. But Đžamonja is a great idea and a visit to the sculpture park is going on my list!